A classy collection of cracking good time rock that will have you reaching for the air guitar. A quick sqwizz at The Brew MySpace page reveals the band’s “location” to be the rock and roll capital of the world, er, Grimsby… However prior to gleaning that information, if you’d asked me to guess where The Brew hail from, I’d have confidently plumped for somewhere on the island of Ireland, due to a sound that sits confidently between the classy confidence of Glyder and the rabble rousing rock of The Answer, resulting in a fine mix of the classic rock that Irish bands seem to be able to produce with a classy authenticity. The guys may be more East coast of England than Emerald Isle, but musically the ease with which they produce gritty, dirty blues ridden rock can’t be disputed. Unusually two thirds of The Brew are a father-son combo of Tim and Kurt Smith on bass and drums respectively, with the pairing confidently kicking up a storm, all the while leaving room for vocalist/guitarist Jason Barwick to hammer out storming riffs, sizzling lead lines and soaring vocals. ‘Sirens Of War’ is a cracking opener, with a sumptuous echo laden vocal combining with a chunky slab of guitars and thunderous drums to great effect. The trick is repeated on ‘Six Dead’, upping the intensity in a manner that almost conjures up a mixture of Zeppelin, Sabbath and Clutch, but with added blues and a less histrionically inclined frontman. 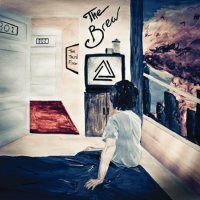 From there title track ‘The Third Floor’ proves that The Brew can rein things in while maintaining a powerful show of authority, before ‘Crimson Glory Raindrops’ floats along on dreamy swathes of guitar, slowly building into something that Hendrix fans will have no difficulty engaging with at all. The songs are always king on this album, but the power and potency comes from the fine musicianship that punctuates all of the tracks on this release and while it is admirable and commendable that neither of the three feel the need to overpower the songs with instrumental flash, their skills are never far from the surface, although the hidden “bonus” drum solo that closes the album is more than a little self indulgent and completely needless. Refined though they can be The Brew operate at maximum velocity when they are rockin’ out, with the rip roaring ‘Imogen Molly’, ‘Let It Back’, or shimmery pop rock blues of ‘Reached The Sky’ hitting the nail, with precision and not a little force, squarely on the head.